Bugera's obsession starts with tubes and ends with one of the most rigorous testing programs of any amplifier manufacturer. Literally every fourth technician in the BUGERA factory is a Quality Control Inspector. Every head and combo undergoes a battery of tests at each stage of assembly. Finally, each amp is burned in, calibrated and tested by a guitarist. Yes, a highly skilled guitarist actually plays through every single amp. Then, and only then, do they earn the name BUGERA. All of these advanced manufacturing methods, old school design and loving care that goes into building BUGERA, means you get a rock-solid amp that can take years of hard use. They can swing both ways. Many of Bugera's amps can be configured to operate in either 6L6 or EL34 mode, enabling your sound to migrate east of the Atlantic ocean to the west coast of the USA. Reconfiguration requires installing the new tubes, which are not provided, flipping a single switch and adjusting the bias voltage. 48-Hour Burn-In Test BUGERA users live for tone. That’s why Bugera put their valves through some of the most rigorous tests known to man. While many of Bugera's competitors test their valves for an hour or so, Bugera burns theirs in for an incredible 48 hours and subject them to extreme loads that push them to their limits. Only after they pass this excruciating test, do they move on to the next step. The Vibration Table is where Bugera stress the tubes mechanically, simulating what your amp goes through as it moves from one gig to the next — that is, if your amp is repeatedly driven up and down a really bumpy dirt road at break-neck speed, with all elements lit up! After the valves pass the burn-in and vibration tables, Bugera subject them to a battery of computer-controlled tests that grades their performance based on 12 crucial operating parameters. At this point, even the slightest imperfection will cause a valve to be rejected. Of the valves that make it this far, only the top 5% are selected for use in the critical first gain stage of Bugera amplifiers. When a valve earns the BUGERA logo, you can rest assured it is the very best of the best! BUGERA build their own speakers. It ain’t easy. A guitar cabinet and the speaker(s) inside is a musical instrument in its own right. Having to buy somebody else’s speakers severely limits tonal options. So Bugera made the mondo investment it takes to build BUGERA speakers in-house. They grind Bugera's own pulp and then form the cones. They wind Bugera's own voice coils, stamp Bugera's own suspensions, machine Bugera's own back plates, hand-assemble and test each speaker. It’s an important part of why BUGERA combos and cabs sound so good. High tech design for classic tone. 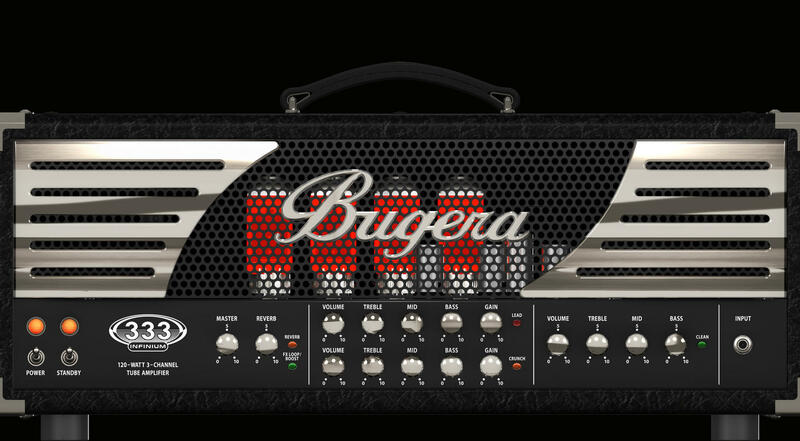 BUGERA amps are assembled using both circuit boards and hand-wiring. They don’t apologize for using circuit boards…because when done right, it’s the best way to minimize noise and maximize durability. Months of R&D time have gone into the design and placement of multiple circuit boards dedicated to each amp section; internal cabling has been planned out in the same careful manner. These modern improvements let Bugera deliver amps that achieve all the classic, vintage tones but with far less of the classic vintage buzz, whine and hum.